John Day, right, vice president and general manager with Pratt Industries, presents Tony Curtis, the CEO of Sofidel America, with a Sustainability Award. Pratt Industries’ environmental awards program honoring some of its most socially-responsible customers continues to single out eco-champions like Sofidel America – one of the nation’s fastest-growing tissue producers. 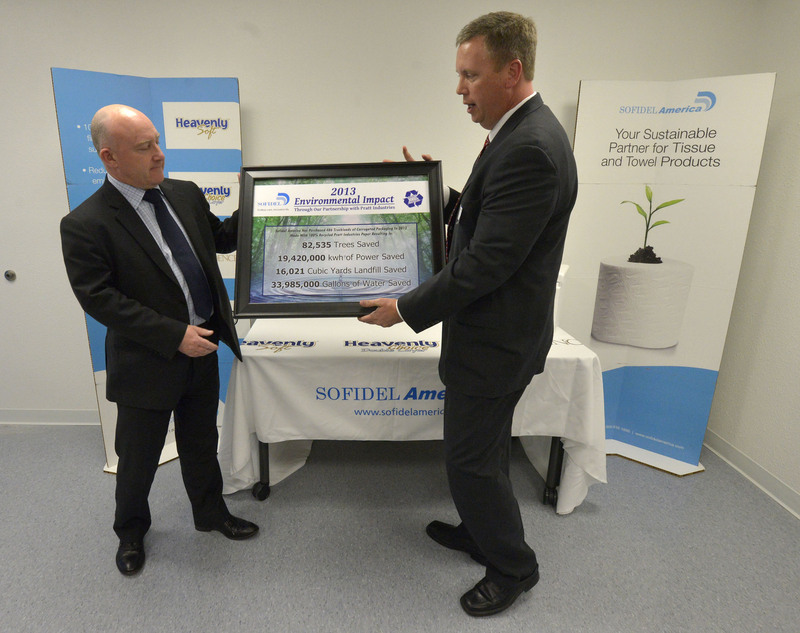 The Florida-based Sofidel was selected for a Sustainability Award for its continued commitment to the environment by using 100% recycled packaging for its products and its ongoing program to reduce water consumption, CO2 emissions and waste. “It’s a great honor for Pratt Industries to partner with innovative companies like Sofidel America because they not only provide great product, service and value to the consumer, but they also show a true commitment to the environment and sustainability,” said Pratt’s Chief Operating Officer David Dennis.